The red ribbon was cut and the first students at the first Sevenoaks Trading Training School went wild! It was an exciting day. 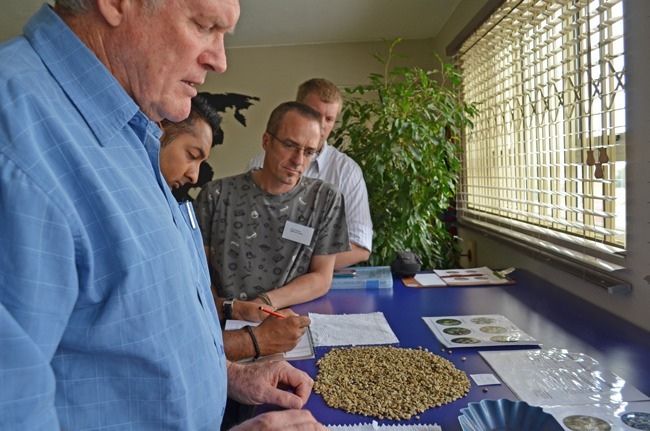 Sevenoaks had organized no less than the incredibly experienced and knowledgeable, Mr Jeremy Wakeford to lead the eager participants in green bean coffee training. 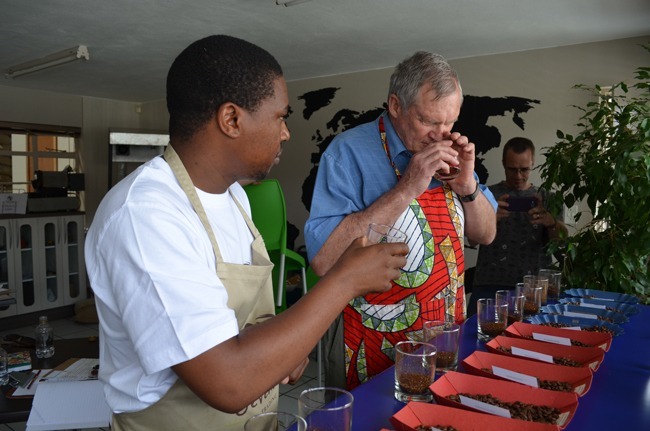 The first class was quite an esteemed bunch themselves, Ishan Natalie of Tribeca, George Karatzas and Neil Maree of Koldserv, Mark Blackenberg of Avanti, Terry Wentzel of Espresso Concepts, Phumlani Sibeko of Stil.Coffee and Chris Pefanis of Highland Coffee in Clarens. To explain a little bit more about Jeremy: The man is a coffee legend. He celebrates 50 years in coffee this year! 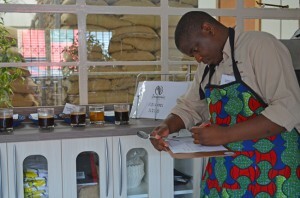 He is a coffee consultant by trade, and specializes in quality control. If you want to test any coffee to see its worth, Jeremy is your man. A huge part of his skill lies in the strength of his palate, which is incredibly advanced. On any given day in his business he can taste upwards of 200 different cups. Wow! He has a very specific cupping technique for tasting the coffee and his slurp is second to none in volume and effectiveness. But he always spits it out, never swallows. He admits that the only stage of his coffee tasting career that he actually drank the coffee was during his apprenticeship after he had had a heavy night after a rugby match. 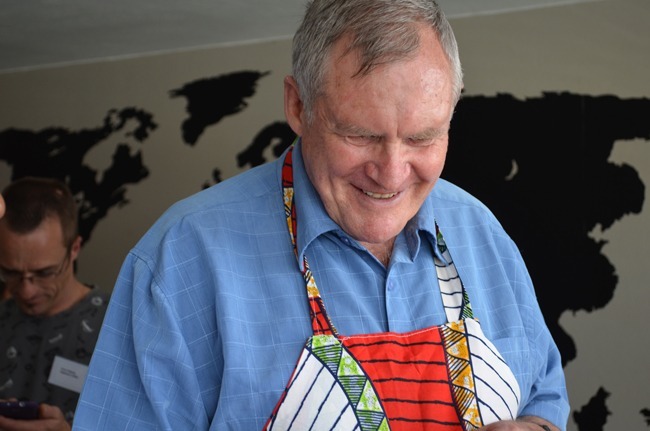 Since then many people have learnt from him, some that you may know, include Japhet who roasts at Colombo and John who does the roasting at Sevenoaks. 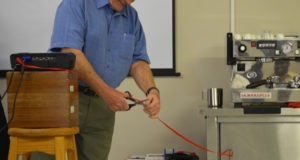 So with Jeremy Wakeford and Izelle Fourie & John Mokobodi (Sevenoaks) as our teachers, the class was treated to two days of unparalleled training. Day 1 included a brief history of the coffee industry and the coffee producing countries and their processes. Interesting facts included expected figures like the US being the biggest importer (including coffee imported by Coca Cola to extract the caffeine for the famous cooldrink) to surprising figures like Finland’s population consume 12kg of coffee a year per person (that’s roughly 1680 cups a year) and the fact that Starbucks actually has very high standards for the coffees that they source. Jeremy explained the difficulties in organic farming and the growing differences between the conditions necessary for Robusta and Arabica plants and within the Arabica family, the various varietals. I had never heard of the Catimor variety which is apparently much more resistant to the coffee leaf rust epidemic that is spreading across Central America. He explained the entire process from cherry to arriving in burlap sacks ready to be roasted. For me, one of the most interesting parts of the training was around the bean defects and how these effect the flavour of the coffee in the cup. We learnt how to identify insect damage, mould damage from the fermentation process, beans affected by drought, stinkers, quakers (unripened seeds) and many more (an alarming number of things can go wrong to our wonder beans, it really does give you a new appreciation for the beans). When Jeremy refers to flavour in the tasting process, he is referring to Acidity, Body and Flavour notes. Day 2 focused on the roasting process and how this affects the beans to varying degrees and how to get the most out of the green beans. Mark Blackenberg brought along Avanti’s 1kg roaster, Neil Maree supplied his shiny new 6kg Genio Roaster and Sevenoaks has two sample roasters that do just 250g of coffee per roast. The training groups are kept small so that everyone gets a chance to take part in the process and get practical experience. The freshly roasted beans, Guatemala Antigua, Indai Plantation AA and Costa Rica Bromelia Fancy were then cupped and discussed by the class. After lunch Jeremy handed over to Izelle Fourie, the brainchild of these training courses. She deftly instructed the class on the importance of the grind when it comes to coffee. 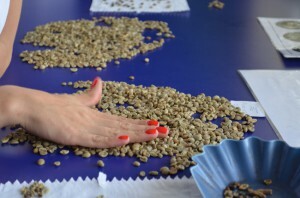 She demonstrated this for us using two blends, one with robusta (which makes the coffee less oily) and one without, showing that each coffee needs to be treated as an individual and the grind should be adjusted accordingly. 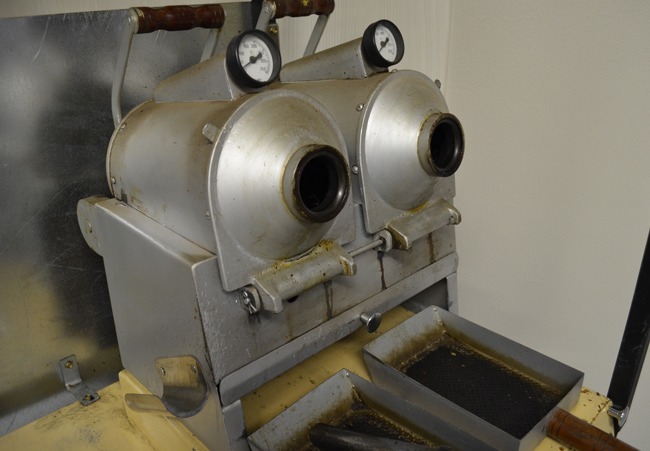 She also demonstrated what effect an incorrect grind can have on your espresso machine, too fine and you stand to put immense pressure on your gaskets and seals which is not good for the longevity of the equipment. 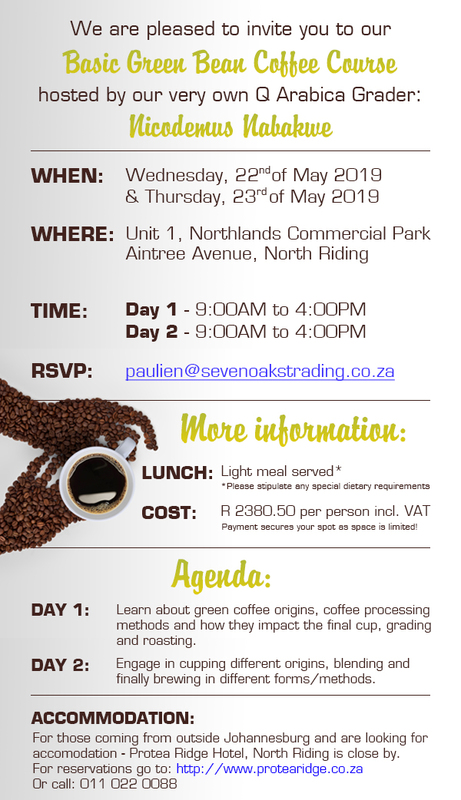 Sevenoaks offers three types of courses; Personalised Training, Basic Introduction of the Green Bean and Startup Training . The courses will be run by Sevenoaks trading as per request. For anyone wishing to attend and for more information about the different courses, please do not hesitate to contact Izelle. For people in the coffee industry, this information is invaluable. 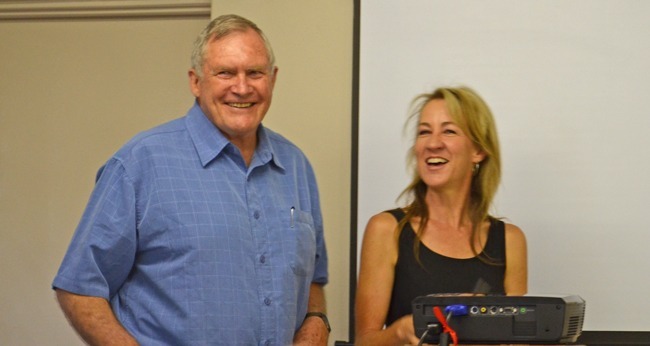 A huge thank you to Carol Lane for the invitation to be there and to Jeremy for imparting his knowledge so humbly. It is an experience that has changed the way I look at coffee.